Total Carnage is a spirtual successor to Smash TV, but ditches the game show motif for more of a parody of the Iraq war, complete with a comical interpretation of a Middle Eastern dictator (General Akhboob). 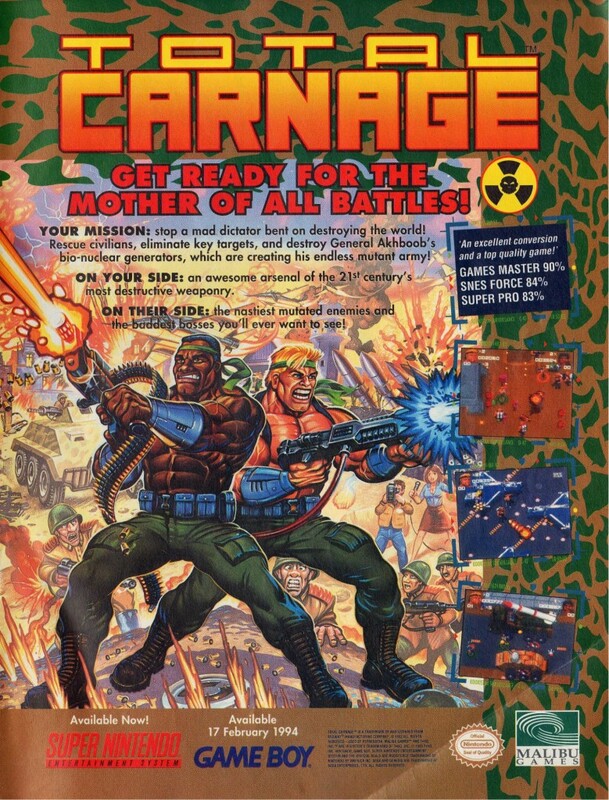 Unlike Smash TV, Total Carnage bombed in the arcade, and thus was not widely ported. This ad is for the SNES version, but you can also find it on the Amiga, PC, Amiga CD32 and Jaguar, along with an emulated version in the more widely distributed Midway Arcade Treasures 2 for the PS2, Xbox and GameCube.